Our last post talked about the fuel that powers nuclear reactors. Today, we’ll talk about what happens to that fuel when it’s removed from a reactor. You’ll recall that fuel becomes very hot and very radioactive as it is used in the reactor core to heat water. After about five years, the fuel is no longer useful and is removed. Reactor operators have to manage the heat and radioactivity that remains in the “spent fuel” after it’s taken out of the reactor. 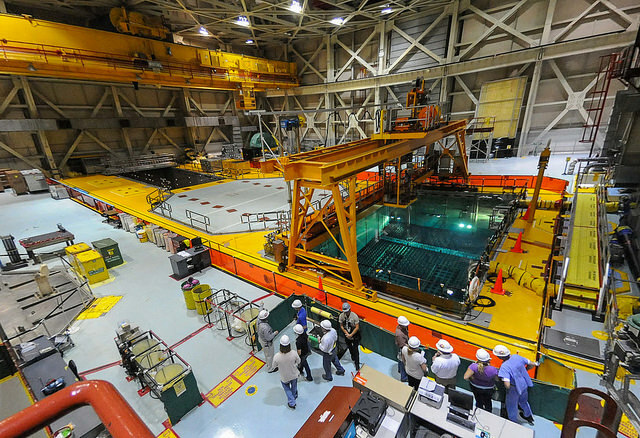 In the U.S., every reactor has at least one pool on the plant site where spent fuel is placed for storage. Plant personnel move the spent fuel underwater from the reactor to the pool. Over time, as the spent fuel is stored in the pool, it becomes cooler as the radioactivity decays away. These pools contain an enormous quantity of water—enough to cover the fuel by about 20 feet. The water serves two purposes: it cools the fuel and shields workers at the plant from radioactivity. Having 20 feet of water above the fuel means there is a lot more water than is needed for cooling and shielding the workers. Also, because of the extra water and the simple design of the pool, there is a lot of time for plant personnel to add water to the pool if needed for any reason. The pools are built to meet strict NRC safety requirements. They have very thick, steel-reinforced concrete walls and stainless-steel liners, and are protected by security personnel. There are no drains that would allow the water level to drop or the pool to become empty. The plants have a variety of extra water sources and equipment to replenish water that evaporates over time, or in case there is a leak. Plant personnel are also trained and prepared to quickly respond to a problem. They keep their skills sharp by routinely practicing their emergency plans and procedures. When the plants were designed, the pools were intended to provide temporary onsite storage. The idea was for the spent fuel to sit in the pool for a few years to cool before it would be shipped offsite to be “reprocessed,” or separated so usable portions could be recycled into new fuel. But reprocessing didn’t end up being an option for nuclear power plants and the pools began to fill up. In the early 1980s, nuclear plants began to look for ways to increase the amount of spent fuel they could store at the plant site. One way was to replace spent fuel storage racks in the pools with racks containing a special material that allowed spent fuel to be packed closer together. Another way was to place older, cooler and less radioactive fuel in dry storage casks that could be stored in specially built facilities at the plant site. We’ll talk more about dry spent fuel storage in future blog posts. Most plants today use both re-designed storage racks and dry storage facilities to store spent fuel. All storage methods must be reviewed in detail and approved by the NRC before a plant is allowed to change storage methods. How does a nuclear reactor generate electricity? Well — it doesn’t, really. Let’s begin at the end and see how it all fits together. We begin by looking at an electric motor. A motor consists primarily of two major components: a stator, which stands still, and a rotor, which rotates within the stator. When electricity is applied to the motor, electromagnets within the stator and the rotor push and pull on each other in a way that causes the rotor to rotate. The magnets in the stator pull magnets in the rotor toward them, and then, as the rotor magnets pass by reverse themselves and push the rotor magnets away. The parts are arranged so the pulling and pushing are all in the same direction, so the rotor spins inside the stator. The electrical energy applied to the motor results in mechanical energy in the rotor. But that same machine can be used in reverse: If some outside force causes the rotor to spin, the interaction of the magnets causes electricity to be produced: the “motor” is now a “generator,” producing electrical energy as a result of the mechanical energy applied to its rotor. That’s the most common way to make large quantities of electricity. So how do you make the rotor spin? That’s where the nuclear reactor comes in, although still indirectly. Recall that a nuclear reactor generates heat. The fuel rods get hot because of the nuclear reaction. That heat is used to boil water, and the steam from that boiling water is used to spin the rotor. As we have seen, when the rotor spins, electricity comes out of the stator. When water boils, the steam that is produced occupies much more physical space than the water that produced it. So if you pump water through some sort of a heat source — like a nuclear reactor, or a coal‑fired boiler — that is hot enough to boil the water, the exiting steam will be travelling much faster than the water going in. That steam runs through a machine called a turbine, which acts something like a highly‑sophisticated windmill. The physical structure is vastly different from a windmill, and a large turbine can be far more powerful than any windmill that has ever been made, but the effect is somewhat the same: the steam, or wind, causes part of the machine to spin, and that spinning part can be connected to a generator to produce electricity. The steam leaving the turbine is collected in a device called a condenser — essentially a metal box the size of a house, with thousands of pipes running through it. Cool water flows through the pipes, and the steam from the turbine is cooled and condenses back into water. Then the water is pumped back through the heater and the cycle continues. Now, back to the nuclear reactor . . . We have seen how the reactor generates heat, and we have seen how heat is used to generate steam and how the steam then powers the turbine, which spins the generator that produces electricity. The final piece in the puzzle is how the heat from the nuclear reaction generates the steam. The fuel rods are suspended in a water bath contained in a large metal container somewhat like a gigantic pressure cooker. A typical “reactor vessel” might be 15 feet in diameter and 20 feet high, and some are much larger than that. In some types of reactors, the water is allowed to boil, and the heat generated in the fuel rods is carried away in steam. These are called “boiling water reactors” (or “BWR”). These are called “pressurized water reactors” (or “PWR”). A small PWR might have two steam generators. A large one might have four. Some have three. The steam from all of the steam generators is typically combined into a single “main steam line” that carries the steam to the turbine, so the reactor and all of the steam generators act together as a single steam source. The water from the condenser is pumped directly into the reactor vessel for a BWR, or into the steam generators for a PWR. So there you have it: the nuclear reaction heats the fuel, the fuel heats the water to make steam, the steam spins the turbine, the turbine turns the generator, and the generator makes electricity. 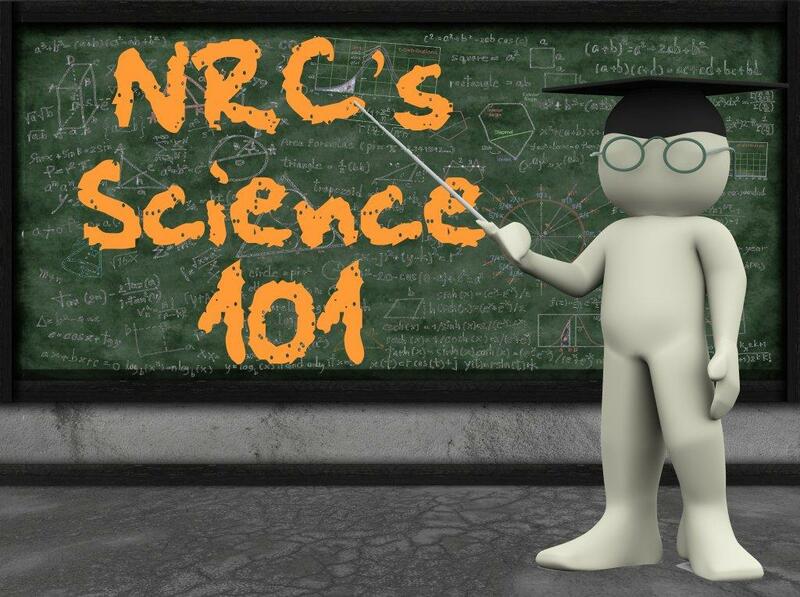 In earlier Science 101 posts, we talked about what makes up atoms, chemicals and matter. In this post, we will look at a specific chemical element — plutonium. Plutonium is a radioactive, metallic element with the atomic number 94. It was discovered in 1940 by scientists studying the process of splitting atoms. Plutonium is created in a nuclear reactor when uranium atoms, specifically uranium-238, absorb neutrons. Nearly all plutonium is man-made. Plutonium predominantly emits alpha particles—a type of radiation that does not penetrate and has a short range. It also emits neutrons, beta particles and gamma rays. It is considered toxic, in part, because if it were to be inhaled it could deposit in lungs and eventually cause damage to the tissue. 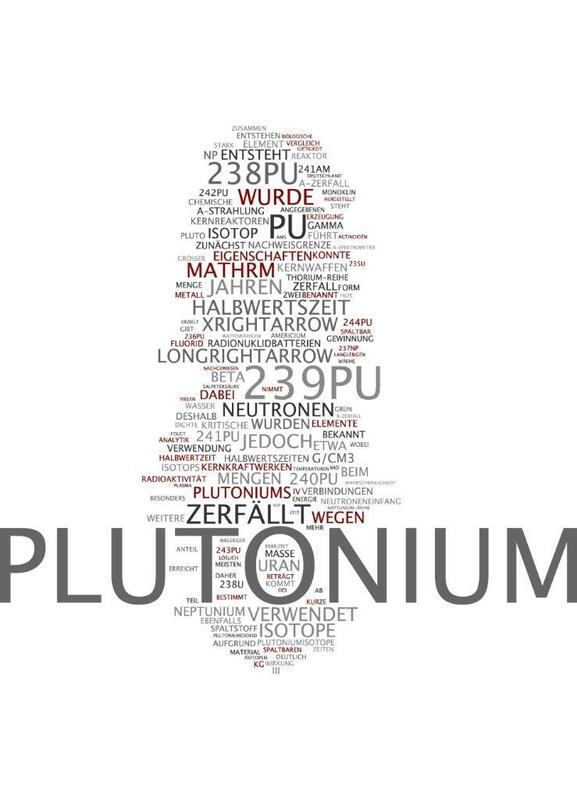 Plutonium has five “common” isotopes, Pu-238, Pu-239, Pu-240, Pu-241, and Pu-242. All of the more common isotopes of plutonium are “fissionable”—which means the atom’s nucleus can easily split apart if it is struck by a neutron. The various isotopes of plutonium have been used in a number of applications. Plutonium-239 contains the highest quantities of fissile material, and is notably one of the primary fuels used in nuclear weapons. Plutonium-238 has more benign applications and has been used to power batteries for some heart pacemakers, as well as provide a long-lived heat source to power NASA space missions. Like uranium, plutonium can also be used to fuel nuclear power plants, as is done in a few countries. Currently, the U.S. does not use plutonium fuel in its power reactors. Nuclear reactors that produce commercial power in the United States today create plutonium through the irradiation of uranium fuel. Some of the plutonium itself fissions—part of the chain reaction of splitting atoms that is the basis of nuclear power. Any plutonium that does not fission stays in the spent fuel. 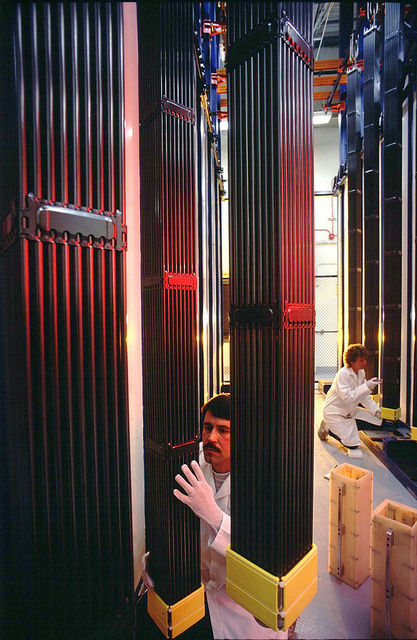 Spent nuclear fuel from U.S. reactors contains about one percent plutonium by weight. The different isotopes have different “half-lives” – the time it takes for one-half of a radioactive substance to decay. Pu-239 has a half-life of 24,100 years and Pu-241’s half-life is 14.4 years. Substances with shorter half-lives decay more quickly than those with longer half-lives, so they emit more energetic radioactivity. Like any radioactive isotopes, plutonium isotopes transform when they decay. They might become different plutonium isotopes or different elements, such as uranium or neptunium. Many of the “daughter products” of plutonium isotopes are themselves radioactive. Many metric tons of plutonium are currently contained in spent nuclear fuel around the world. To be usable, plutonium needs to be separated from the other products in spent fuel through a method called reprocessing. Reprocessing separates plutonium from uranium and fission products through chemical means. 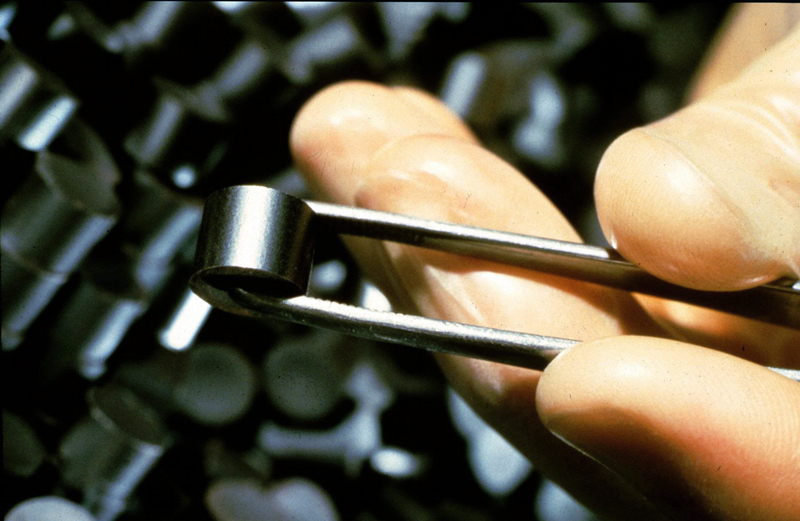 Once separated, plutonium oxide can be used as fuel for nuclear power reactors by mixing it with uranium oxide to produce mixed oxide or MOX fuel. The U.S. government has historically discouraged the use of this technology for national security and environmental reasons. The NRC is currently overseeing construction of a facility in South Carolina to make MOX fuel using plutonium removed from U.S. nuclear weapons declared excess to military needs, as part of a Department of Energy program to convert it into a proliferation-resistant form that would be difficult to convert again for use in nuclear weapons.